May 3 is now less than one month away. That's the day when anybody holding onto a copy of Halo 3: ODST will be invited into the public Halo: Reach Beta, free of charge. The details on what to expect out of the Beta have been coming in hot and heavy over the past few weeks. I hope you're ready for a whole lot more. I had the opportunity to chat with Chris Carney and Lars Bakken, Multiplayer Design Leads at Bungie, about the four maps which will serve as the killing grounds for the Beta. There's Swordbase and Powerhouse, two maps that will feature "party" game types like Headhunter and Slayer in the Beta. Backing them up is Overlook, a space pulled from the campaign that will feature the Generator Defense test situation. 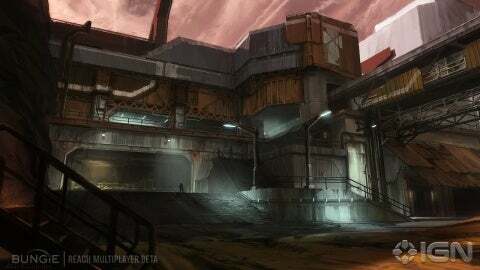 And then there's Boneyard, a map that Bungie is staying relatively quiet about for now. Jetpack balancing, design choices, fall damage, game modes, the man cannon and more -- this huge interview is chock full of brand new info. IGN: Why did you choose these specific maps for inclusion in the beta? Chris Carney: All four maps were chosen in order to test a specific selection of gametypes and team sizes. Sword Base and Powerhouse cover the Slayer, Headhunter, end of the spectrum, Overlook is perfect for the NT 1* ("Generator Defense") game type, and Boneyard is a great landscape custom built for Invasion. Each map brings unique elements that we want to evaluate and hopefully contain enough variety to be appealing for the duration of the Beta. *"Network Test 1", the not-so-fancy name for one of our targeted tests/experiences in the public beta. 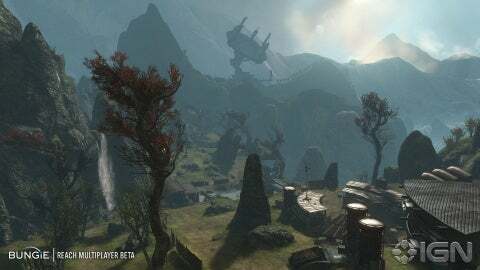 IGN: Which of these four Beta maps is your personal favorite? Lars Bakken: You know, I'm really growing to love Powerhouse. That's kind of our outdoor, pioneer aesthetic -- which is what the pioneer structures look like on Reach. The artists have done a lot of work background concepting what that space would look like. Those buildings and that area of Reach and that particular map I find really fun to run around in. It's kind of a cool nice, breezy outdoor space. I love the sightlines in it and I love the mix of indoor and outdoor combat that you get in it. It's quickly becoming my favorite in the Beta maps. Chris Carney: It's cool because it's built for four on four Slayer, which I think is all of our favorite game type, so we play a ton on that map. I like Boneyard which is completely crazy and probably one of the biggest maps we've done. I think we were inspired by the beaches in Bangladesh where they pull in those oil tankers and other big ships and cut them apart. We're doing that essentially with space frigates on Boneyard. That's for Invasion, which is our six on six game type. Boneyard concept art. More details on this puppy will be revealed soon. IGN: All four of these maps are human themed, and Reach takes place on a human planet. Does that leave much room for Covenant or Forerunner themed maps? Chris Carney: All of the maps in the Beta are human themed, but several of the other maps have different themes that I think are really cool. I don't really want to talk about them because it would talk about things that are happening in the single-player story. But, yes, we have come up with a cool palette of environments for ship for multiplayer. IGN: With the inclusion of things like jetpacks and sprint armor abilities, it seems like you would have to take a whole new approach to level design. How did you begin the process and how did you ensure that you were constantly thinking about how to incorporate the new gameplay elements properly? Chris Carney: Jetpacks and Sprint definitely change the way players move through the environment. We started much of the level design before these elements really came into their own, so they did not initially impact the design of the levels. However, as we have expanded the capabilities of all of the armor abilities, we have had to react somewhat. That one jump that used to be "challenging" is now "forgotten" with Sprint. But we have also tried to balance each armor ability appropriately so their simple use does not dominate the environment. This has required extensive testing and iteration and hey, everyone will be continuing to assist us in this process by playing in the Beta!